Why Build A Steel Garage Or Shed? When people decide they need the extra space, there are many reasons why. Our flexible B&G Sheds designs are easily customised to suit your exact needs. Pick the shape, length, width and height that suits you. Pick from a range of door options. Choose a wall and roof cladding profile to match your architectural style and then select from more than 20 available Colorbond colours. Add personal access doors, windows, sliding glass doors, verandahs and other inclusions to suit your needs. All of our buildings are built from non-corrosive high tensile galvanized steel framework with Zincalume or Colorbond wall cladding and roofing to ensure that your steel garage is made to last. New designs, colours and profiles make the modern steel garage a stylish alternative to traditional garages. 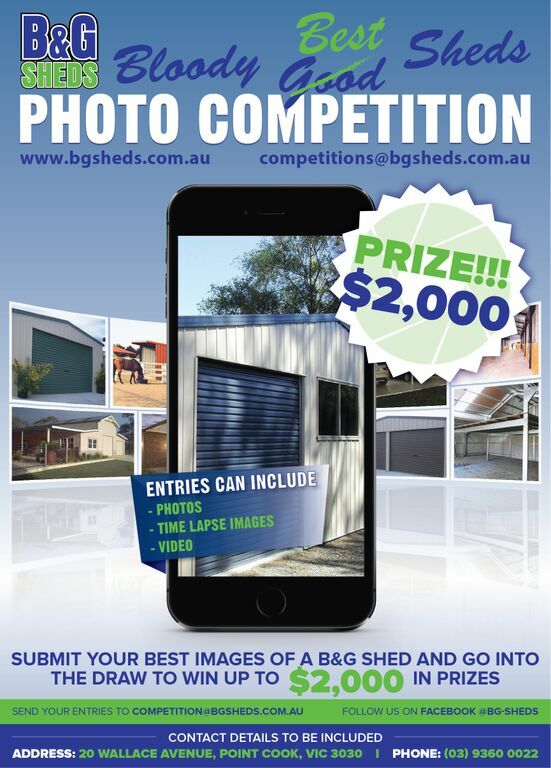 Our B&G Sheds building range use exclusively Australian made Bluescope Colorbond and Zincalume steel. They are guaranteed to be low-maintenance: You will never have to repaint your steel garage. Workshops –add a few extra windows and a skylight. Storage areas – for tools, equipment, bicycles, surfboards and all your favourite stuff! a “Man Cave” with beer fridge, couches and TV. a gym with lots of space. ** beware that there can be are both planning and building issues when using a Class a Garage as a residential or commercial space. Do you supply kit only or fully installed? We supply a wide variety of buildings in kit form for the owner builder or total building solutions, complete with all permits, delivery, installation labor and concrete floors. Many of our customers will do some of the project themselves. Some will buy a kit but have us obtain the permits; others will have us install their building but do their own concrete works. We are totally flexible! What are the standard sizes? Do you do non-standard sizes? Our exclusive computerized design package gives us increased accuracy and flexibility of design, so we are able to manufacture buildings of any length, width or height -not just the common sizes. How long does the project take? Do you do extensions and alterations? Yes, but only to buildings previously supplied by B&G Sheds. How do I prepare the site for the building works? All works are quoted assuming a clear and level site. Level is considered to be within 75mm from the highest to the lowest point. It there is a fall the site may need to be filled, cut and filled or excavated. If you have a fall, advise the sales team so that the concreter can arrange to inspect the site prior to construction. The working area around the building required by the builder for easy use of ladders is 1.2 Mt beyond each wall of the building. When a building is being built adjacent to a boundary, the walls adjacent to the fence will be prefabricated on the ground and tilted into position. This method is available for buildings up to 3.0 Mt high. To prepare the site for a builder please mow any grassed area, and clear all above ground debris including animal droppings. Please have all animals suitably restrained from the working area. Be sure that there are no overhanging trees interfering with the working area and/or trim trees so that they are a minimum of 1.0 Mt away from the walls and roof of the building. To enable clear access for builders and concrete trucks, please ensure the driveway is clear of all vehicles. To provide quality at the most competitive price we operate on strict credit terms. This is critical to our competitive pricing policy. The next stage of work will not proceed until the payment has been made. A deposit of approximately 30% of the kit is required at the time of placing the order. A contract is not valid until the deposit has been paid. In the case of Government departments, a purchase order may be accepted by arrangement with the management. The Contract price is not fixed until all permits are approved, and the material can be ordered. Upon the completion of the concrete floor, please contact our office and arrange to pay the amount due. Cheques are to be made out to Professional Shed Builders. Upon completion of the erection work, the builder is to receive either cash or Bank Cheque for the erection work. The Bank Cheque is to be made out to the Building Contractor. The Building Contractor will provide an invoice when he arrives on site. The Building Contractors do not offer credit card facilities. All work is paid for as each stage is completed, protecting both parties as equitably as possible. A Site plan showing your house position and the proposed shed location. Show on the site plan any houses on adjoining properties. In most cases we have included a fee for Documents Search in which we obtain all of the above documents from the Titles Office and various websites. Do you have displays on site? Our display yard is located at 20 Wallace Ave, Point Cook. The new display yard features single and double car garages, farm sheds, a raised roof barn and our carport / verandah system. Our operating hours are Monday to Friday 9.00am to 5.00pm and Saturday 9.00am to 1.00pm. What is the Factory Finish? The B&G Sheds standard building is finished according to the engineering requirements using materials superior to similar competitors. However the preferred finish for larger buildings is the "Factory Finish". It features Trimdek 0.47mm wall cladding, which is a stronger and more attractive profile, your choice of Corrugated or Trimdek roofing profiles and 150x100 flashings to all corners. For buildings 3.0 Mt high and above or 7.5 Mt span or wider, it is our opinion the Factory Finish is a must. Do you use BHP steel? B&G Sheds are committed to providing the highest standards of service and product quality. We use the best Australian made materials available. All steel framing, wall cladding and roofing materials are supplied by BHP Building Products, incorporating the proven Lysaght's range. The rolladoors are supplied by B&D Doors. Our garages and farm sheds are available in either Zincalume or Colorbond. They can be all Zincalume, all Colorbond or Colorbond walls doors and trims with a Zincalume roof. Customers are able to choose from the full range of 22 BHP colours and can choose contrasting colours for the doors, gutters and downpipes as required at no extra cost. Is this a fixed contract price? When outside of Melbourne Metro areas the cost of concrete will vary. Concrete floors are calculated using a concrete supply cost of $180/M3. In those areas, the extra cost of local supply will be determined and quoted to our during the concreters site inspection. After the concreters site inspection, all unknowns will be quoted for and the concrete floor costs will then be fixed. When there is no power and generators are then required. Both the concreter and building contractor will need power. Any structure greater than 10Mt2 requires a building permit. How do I calculate the cost of works? It is the responsibility of the building surveyor to check that the cost of works includes the cost of the preparation of drawings, permit costs, site preparation, all materials, installation labor, concrete floors, and connections to the legal point of discharge. What is a "legal position"? A steel garage can be 0.15 or 1.0 Mt off the boundary but nothing in between (e.g. not 0.60). The building must have a 1.0 Mt daylight gap (gutter to gutter) away from the house or any building attached to the house. Other checks must also be made considering restrictions from the plan of subdivision, agreements and covenants, easements, length and height on boundaries and overshadowing rules. Can I build over an easement? A steel building can be built over an easement with the consent of the proper authorities. To build over a drainage and sewerage easement, permits approvals are required from the local sewer authority and the local council. A building permit cannot be issued until these permits are supplied to the registered building surveyor. Some authorities have restrictions that limit the total of all buildings to not cover more than 8.0 Mt of the pipes in the easement. What approvals does an owner builder need? When an owner builder is nominated, a Certificate of Consent from the Building Practitioners Board is required to be issued when the domestic building work is greater than $16,000. An owner-builder will not be able to obtain a building permit without a Certificate of Consent. What obligations do owner builders have when selling their property? If a property owner sells their house within six years of completing work as an owner-builder, they must provide warranty insurance cover to the purchaser of the property. They are also required to provide a technical inspection report that identifies defects. It is an offence to sell a building without the required report and insurance. Penalties of up to $10,000 apply. Can owner builders undertake demolition and removal work? It is rare for a permit to demolish a building to be issued to an owner-builder. To obtain such a permit, the owner must demonstrate to the relevant building surveyor that he or she has the necessary knowledge, experience, equipment, and storage facilities to properly conduct the demolition operations as required by the Building Regulations. Should I lay a concrete floor first or last? Concrete is very corrosive. If a concrete floor is poured after competition of the building, there will be corrosion of the cladding around the bottom 300mm or so of the wall sheets. Bluescope Lysaght will also void their Colorbond warranty if any part of the wall cladding is stuck to concrete. By laying the concrete floor first, the concreter is able to properly box the concrete and finish it to a professional standard. Infill slabs poured afterwards never come up to the same standard. All our slabs are laid completely level, so it is easier for the concreter to deal with site fall and customers other requirements eg: drains. The side wall cladding overlaps the concrete floor by 30-40mm and therefore will always be waterproof. If required, "vermin flashings" are available to prevent dust and vermin coming into the building. If the concrete floor is not laid first with the foundations, a set of footings pads will have to be laid first to attached the building to. If you add the cost of the foundations to the cost of a slab poured later, you will see that it exceeds the cost of doing both at the start. What warranty is there on the building? All buildings have a 6.5 year structural warranty. Different components have varying warranty eg windows, rolladoors which we pass on as per the manufacturer's warranty. Any installation works are backed by a 12 workmanship guarantee. Can I live in a shed? A person is able to live in their shed- as long as they meet certain conditions. Generally living in a shed is not allowed because a shed is generally a class 10a building, and these are not for habitation. To be able to live in a shed you must ensure that it has Class 1 engineering so that it is habitable. It is also important to speak to your local council or a building surveyor, as you need approval from the council in order to use a shed as a temporary dwelling and you may need to provide a Development Application approval for a future home (so the council can see that the shed is not the only building intended for the property). It also needs to meet the basic standards with things such as proper insulation, efficient hot water, good ventilation and so on. The shed needs to be connected to the sewer or an appropriate septic system and the concrete slab must have a vapour barrier. You also need to meet minimum ceiling heights. Other things that your shed will need include water, power, wall and floor coverings, doors and windows – everything that you would expect of a standard home. You need to know that trying to use an existing slab causes lots of issues. We normally have the wall sheets overlap the side of the slab by 30mm. That is how we get the garage to be waterproof. You can't do that with an existing slab, unless it is exactly the size of the new garage. We normally have a ramp at the rolladoor openings to stop weather coming in. That will not be there when using an existing slab, so you can expect water to blow in under the rolladoor. Remember that the slab will also need to be 150mm off the side and rear fences (otherwise >1.0 Mt). Check that you are not over an easement as that will cause a lot more problems that cannot be solved. Stay at least 100mm outside any easement area. Existing slabs are usually not level. Concreters put a fall on outside concrete and older sheds. So, the shed base will have to be cut on site to fit the slab. That will cause extra costs on site and will cause corrosion at the base where the steel sheeting and columns have been cut. The building surveyor will not accept you slab as being suitable as he has not been able to inspect it before it was poured. Unless you can demonstrate that the slab is 15mm thick, he will not allow it to be used. Another way to get around that is to cut out squares where the columns of the shed will be, dig new foundations of a size suitable to hold the shed down the shed without the assistance of the slab, put dowels in from footing to slab, get it inspected and then repour. That will satisfy the building surveyor and allow you to get a building permit. My usual suggestion when looking at this situation is to remove the old slab and lay a new one. The cost of cutting up the slab and taking the spoil to a recycling plant is usually $600-1000 depending on the size of the slab. To cut in a new set of foundations will usually cost $1000-1500 depending on the size of the garage. Our concrete crews can provide that service for you or you can organize it yourself. By putting in a new concrete floor, you will have a waterproof garage that looks great and complies with the building permit requirements. Using an existing concrete floor will leave you with a building project full of headaches and comprises. Simple maintenance of COLORBOND® steel and ZINCALUME® steel by regular washing with water, will not only enhance its life but maintain its attractiveness for longer periods thus protecting your asset. Applications where the paint finish is automatically washed by rainwater do not usually require this maintenance, e.g. roof cladding. Examples of applications requiring maintenance cleaning include wall cladding under eaves, garage doors and the underside of eave gutters. Areas not regularly washed by rainwater should be hosed down at least every six months and more frequently in coastal areas where marine salt spray is prevalent, and in areas where high levels of industrial fallout occur. Wall sheets on buildings need extra attention. Make sure that the bottom of the wall sheet is well clear of dirt & clay, garden much, crushed rock and other materials. These materials all contain mineral salts and are highly corrosive to any steel. Ensure that the materials are kept clean and that dirt etc does not cake onto the sheets. Wash the surface with a mild solution of pure soap or mild non-abrasive kitchen detergent in warm water. Application should be with a sponge, soft cloth or soft bristle nylon brush, and should be gentle to prevent shiny spots. The COLORBOND® steel and ZINCALUME® steel should be thoroughly rinsed with clean water immediately after cleaning to remove traces of detergent. Never use abrasive or solvent type cleaners (turps, petrol, kerosene, paint thinners) on COLORBOND® steel and ZINCALUME® steel. If cared for in accordance with these instructions, your building components made from COLORBOND® pre-painted steel and ZINCALUME® steel will give many years of low maintenance life.